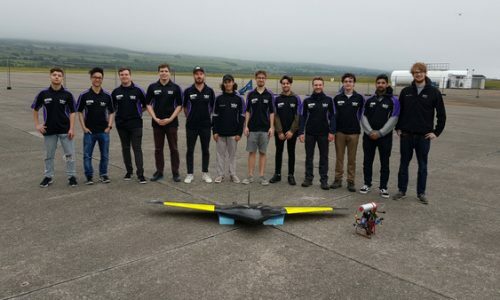 The teams’ aim was to design and manufacture an unmanned aircraft system to compete at the 2018 IMecheE UAS challenge, an event held in Llanbedr, Wales. This will be the second year UCL enters the competition. The challenge features a real-life scenario: a disaster struck region requires humanitarian aid delivery. This is simulated by two missions: the first is to deliver a payload to a specific target, the second is a reconnaissance mission to identify multiple targets. The competition is scored on aircraft design and performance in missions 1 & 2. 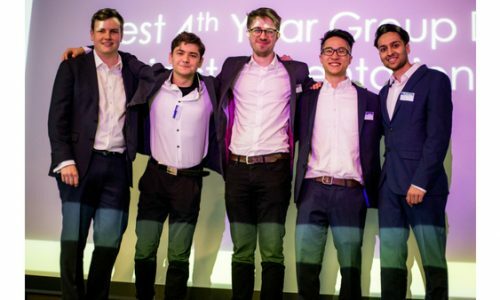 Specific focus was put on creating an innovative design that would score highly in each aspect of the competition. The final design featured a carbon fibre monocoque, which reduced the unladen weight of the aircraft to 4.4 kg, with a payload capacity of 2.5 kg, nearly half its weight. Finite Element methods were used to select a composite lay-up which ensured structural strength during operation. Computational Fluid Dynamics was used within the design process to determine aerodynamic characteristics, which have also been validated using wind tunnel experimentation. 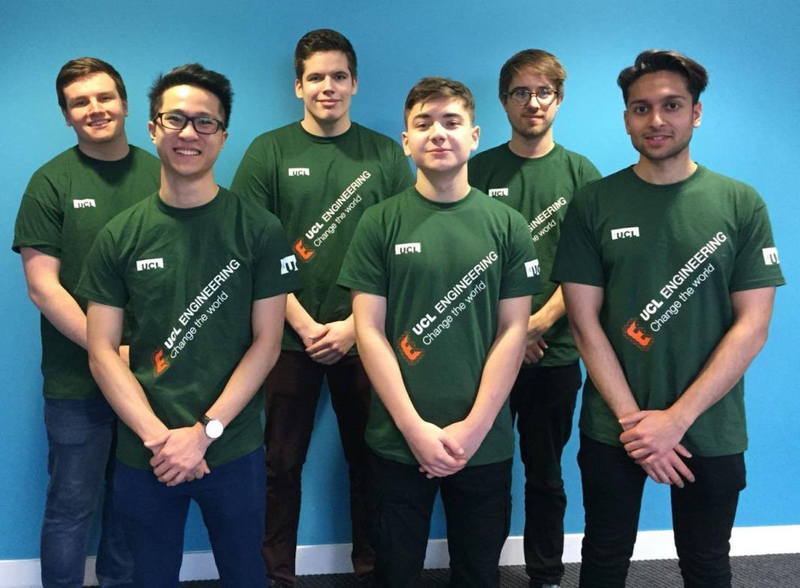 Machine learning algorithms have been designed and trained for use in conjunction with image recognition techniques to complete the reconnaissance mission. A payload delivery system created by the team to fit within the design will be used for the payload delivery mission. 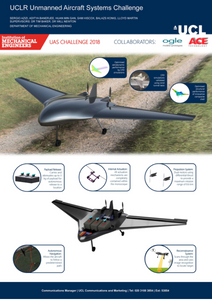 The UAS has an operating range of 8.6 km and an efficiency of 407.5 m/Wh with a payload capacity of 2.5 kg. To put this into perspective, this means the UAS can deliver 21 kg worth of payload for a 1km radius using multiple trips without the need for refuelling. 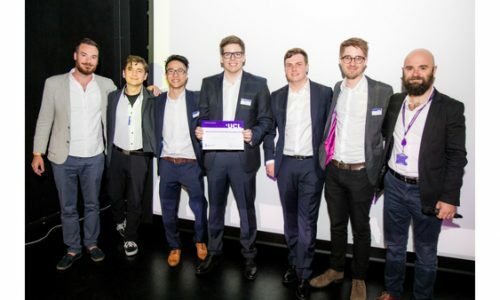 UAS Team 1 won Best MEng Group Presentation. 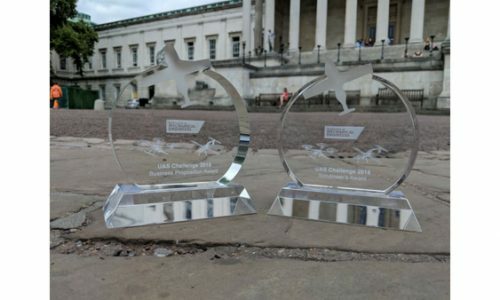 Team 1 at the IMechE UAS Challenge (June 2018) with supervisor Dr Will Newton and Team 3.
the Scrutineers' Award and the Business Proposition Award.